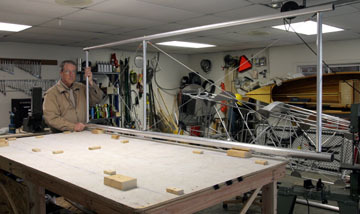 The outer wing panel spars are constructed in the same manner as the center section. 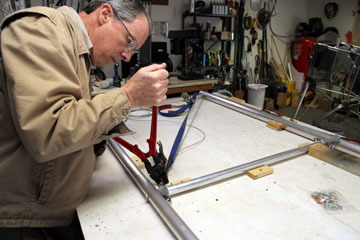 The spars were drilled for compression struts, blocked out on the bench making sure everything was square, and plugged into the center section to assure spar-to-spar dimensions were correct. 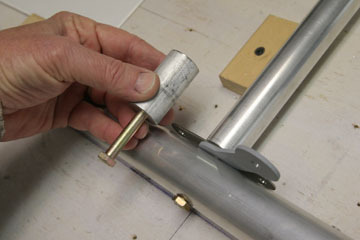 The compressions struts are attached to the spars with plugs that are secured with AN5 bolts and nuts inside the plugs. 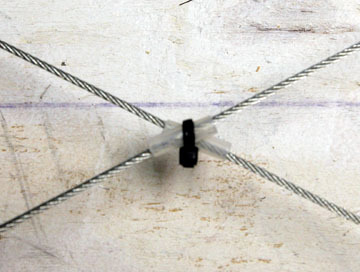 Sandwiched between the plug and spar are combinations of drag-antidrag tangs and/or lift tangs depending on the location. Shown is a double drag tang and a heavy steel lift tang at rear spar mid-span. This particular bolt also goes through a doubler inside the spar. 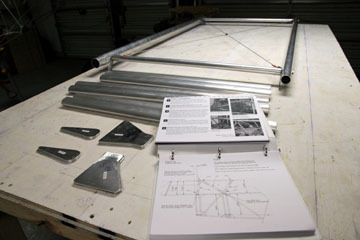 This panel has the compression struts in place ready for the plugs to be secured with rivets and the drag-antidrag cables fabricated. 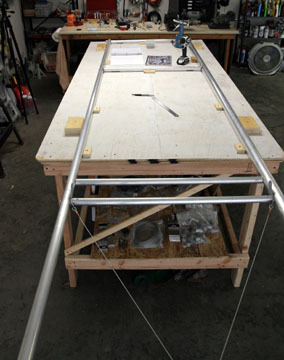 Total time to drill the spars and get the wing panel to this stage was less than two hours. An abbreviated work session finished up the top right wing spars. Here is the ratchet strap in action pulling slack out of a cable. The first cable in a bay shouldn't be pulled overly tight because it will tend to distort the panel. 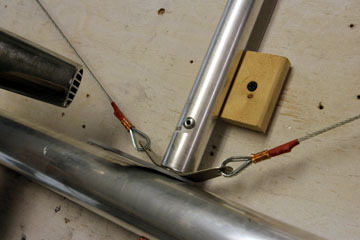 But if pulled snug the second cable can be cranked down tightly and it will tension both cables nicely. The panel was continually checked to assure it wasn't being pulled out of alignment. Good blocking on the bench will go a long way in keeping everything straight. A nice touch is shrink tubing over the cut end of the cable. This not only looks professional but will prevent nasty cuts from the razor-sharp cable strands. Might as well slide a couple lengths of plastic tubing into place along with the shrink tubing. This along with a zip tie makes an easy way to secure the cables where they cross so they won't chafe. 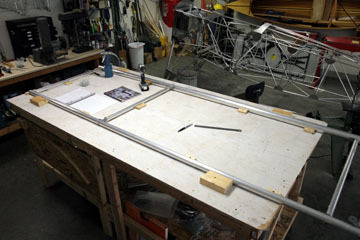 Top right wing panel ready for final assembly. Hint: I often hear comments about how quickly my projects take shape. This isn't due to exceptional shop skills, but more likely to good shop organization and work flow. Here is the bench prepared for the next work session. 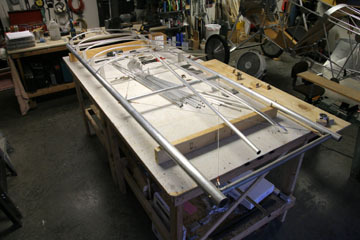 The shop has been been swept clean, tools put away, and all the components needed for the next session are positioned close to where they fit in the assembly. This allows me to make sure all pieces needed are present, and lets me mentally visualize the next session. All mental gymnastics will have been accomplished before starting the next session so work can proceed promptly once the session begins. More thoughts along this line are in the article I wrote about "Working Smart". 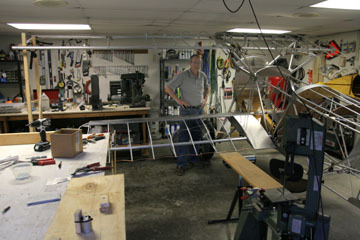 The next step is a huge one--rigging the top wing center section and building N-struts. The sage continues on the Top Wing Center Section page. 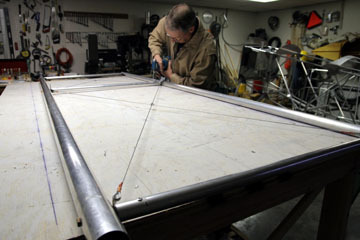 The top wing ribs are bent with the large bending fixture. 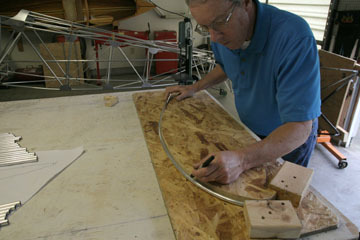 When the tube springs back it retains the proper airfoil shape. A reference mark is made on each rib so the ends can be trimmed uniformly. 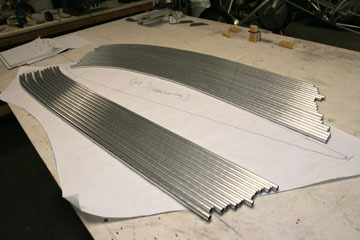 Rib tubes bent and ready for trimming and coping of the ends. Assembly of the top left wing panel has begun. 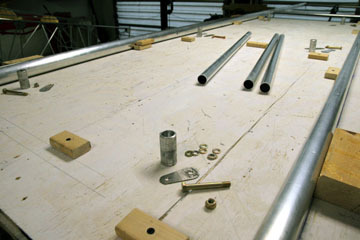 I needed to make decisions on how to build the root ribs in order to accomodate the landing wire fittings in the center section. 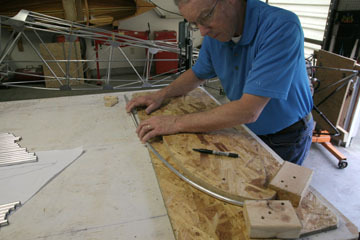 The best way to visualize this area was to plug in the top and bottom wing panels. This was the first time I could grasp the scale of the D.VII. 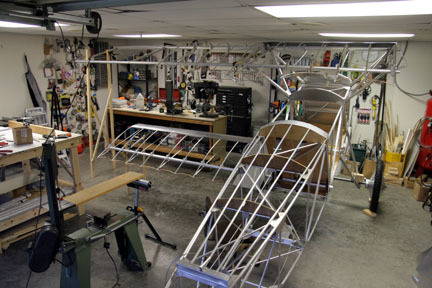 My shop isn't large enough to assemble the entire airframe so I'll probably semi-rig it a half at a time. I should be able to build the N-struts in this manner. Another milestone...just over three months into the project.